a. use integration to find f(x). Give your answer as a polynomial in its simplest form. b. Show that , where p is a positive constant. State the value of p.
c. Sketch the graph of y = f(x), showing the coordinates of any points where the curve touches or crosses the coordinate axes. We are given coordinates of a point on the curve (3,6). We are required to find the equation of y in terms of x ie f(x). If a point lies on the curve , we can find out value of . We substitute values of and in the equation obtained from integration of the derivative of the curve i.e. .
We can now compare the given and the found equations. It is evident that it is a cubic equation. We can now sketch the curve as follows. ü Find the sign of the coefficient of . This gives the shape of the graph at the extremities. It is evident that with positive coefficient of will shape the curve at extremities like increasing from left to right. ü Find the point where the graph crosses y-axis by finding the value of when . We can find the coordinates of y-intercept from the given equation of the curve. Hence, the curve crosses y-axis at point . 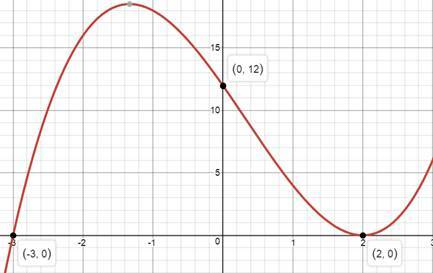 ü Find the point(s) where the graph crosses the x-axis by finding the value of when . If there is repeated root the graph will touch the x-axis. We can find the coordinates of x-intercepts from the given equation of the curve. Hence, the curve crosses x-axis at two points and . ü Calculate the values of for some value of . This is particularly useful in determining the quadrant in which the graph might turn close to the y-axis. ü Complete the sketch of the graph by joining the sections. ü Sketch should show the main features of the graph and also, where possible, values where the graph intersects coordinate axes.